Earlier this week, I went grocery shopping. I had a set time frame (one hour, which is how long a boy scout meeting lasts), a set budget, and my list of what I needed. My grocery bill came up just shy of $120, which rounds out to about $0.48 per person, per meal, and like I said, that doesn't even include the snacks. Now before I move on, I want to answer a few questions. Do I use coupons? No, not really. For one thing, I don't have the time or printer ink to do all that. Also, I live on top of a mountain, and we have ONE very nice grocery store. We do not have Walgreens, and CVS, and Target, and Wal-Mart, and Harris Teeter, and etc. etc. etc. We have a Smith's. In the summer, we also have a farmer's market, but only on Thursdays, and only until noon, and I never remember it, and I don't carry cash. My options for grocery shopping are supremely limited. How often does my family eat meat? It kind of depends, but I'd say 3-4 dinners each week include meat. The meat is rarely the main event at our house. I would say that 3/4 of our plates are filled with vegetables and a starch. I use mushrooms a lot, because textually, they are meaty. In fact, I tell my kids all the time that mushrooms are the meat of the vegetable world. We have also "tricked" a lot of children into accidentally eating mushrooms, and enjoying them. What about food allergies? What about them? We DO have food allergies at our house. We also have food intolerance's, and food preferences. As far as preferences go, I don't care what you like. Something I say all the time is, "I am not a restaurant. I do not take orders." I also have a sign in my kitchen that says "Today's Menu: Eat it or Starve". But I'm getting off track. Food allergies: shellfish and white fish. Food intolerance's: dairy, yeast, and preservatives. Do you eat any fresh food? Oh my life, YES. Yes, yes, yes. We love our fresh fruits and veggies. When I'm deciding what to eat, and in what order, I go fresh to frozen. For example, dinners featuring leafy greens are eaten first, because they go bad first. Meanwhile, carrots and cabbages can last quite a while. This is why I love menu planning, because it helps me to feed my family good, home-cooked food, without going crazy, losing sleep, or murdering anyone. In a nutshell, here's what I do. Breakfast and Lunch are the same week to week. This means that on Monday, we have a breakfast sandwich, and then a turkey wrap for lunch. Tuesday, we have rice for breakfast, and homemade chicken nuggets for lunch. Wednesday is breakfast burritos, and soup. You get the idea. Dinners are where the fun begins. I have color-coded menu plans and shopping lists. My Basic Shopping List only includes the food items needed for Breakfasts and Lunches. It also includes all the different household supplies we need, because my grocery budget/toilet paper budget is one and the same. NOW. Before I go any further into explaining how my meal-planning system is set up, I need YOU to do some homework. Step One: Grab a pencil and paper, and WRITE DOWN all the dinners you LIKE to eat, all the dinners you WOULD like to eat, and what your FAMILY eats. Thinking of dinners is the hardest part of menu planning, so I'm going to share what WE eat around here. 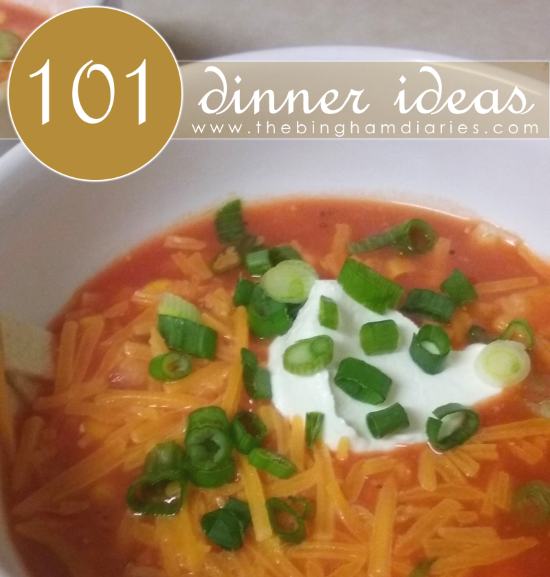 There's 101 dinner ideas, which means that you could go almost 4 months with no repeats. If that's not glorious, I don't know what is. Feel free to steal/copy any dinner ideas that sound good to you!